Lexington Houses Blog: 7 Tips to Prepare Your Lexington Home for Fall! 7 Tips to Prepare Your Lexington Home for Fall! It’s hard to believe that Labor Day is behind us and we’re quickly moving into the beautiful fall season here in Lexington MA! Autumn is a wonderful time of year with the vivid colors of orange, red and yellow coloring the leaves and the crisp blue sky. For those of you who currently live in Lexington, you know that the weather can quickly change from the warmth of late summer to the crisp chill of the fall. Because of this change, it’s important to ensure your Lexington home is ready to adapt to the coming season. As a Lexington Real Estate agent, my goal is to not only provide with you with tips on buying your dream home in Lexington, but to also get the most out of your home and lifestyle in our charming town. Below are seven key tips for preparing your Lexington home for fall you don’t want to miss! 1. Inspect your roof and chimney- If your roof isn't too steep, and isn't covered with slate or tile, you may be able to carefully walk on it on a dry day. Look for broken or missing shingles, missing or damaged flashing and seals around vent pipes and chimneys, and damage to boards along the eaves. Also peer down your chimney with a flashlight to make sure no animals have set up house in it. If you can't get on your roof, perform this inspection with a ladder around the perimeter. Some patches and roofing cement now can prevent thousands of dollars of water damage later in the winter. 2. Check gutters- Do a quick visual check to make sure gutters are clear; they'll be performing double duty soon with rainstorms and falling leaves. 3. Check storm windows- If you have storm windows that are cracked or dirty, repair and clean them now; prior to autumn installation. 4. Add weatherstripping to doors and windows- Weatherstripping can be plastic, foam, felt or metal; its job is to seal small gaps, keeping moisture and cold air outside where they belong. Newer, energy-efficient windows generally don't require added weatherstripping, but if your windows are older, weatherstripping can keep drafts at bay and energy costs down. 5. Insulation speculation- This is a good time to check the condition of insulation and see if you need more, especially if you live in an historic Lexington home. You can purchase un-backed or loose-fill insulation if you are just beefing up what is already there. If your walls lack insulation, consider having a professional install blown-in insulation foam. The energy savings will probably offset the cost of the procedure in a couple of years. 6. Keep mice out- The fall inspires nesting in mice as well as humans. Mice are looking for a warmer home now, and that newly insulated attic would be just the spot. Mice can squeeze through 1/4-inch openings. Make sure all exterior vents are screened, and that there are no gaps underneath garage doors. 7. Caulk exterior- Think of caulk as weatherstripping in a tube. 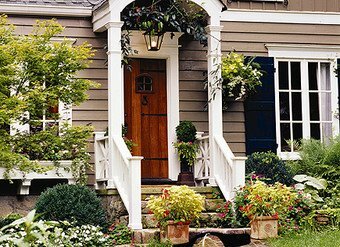 Any gap on the outside of your home can be a candidate for caulking. Look at transition spots: corners, windows, doors, areas where masonry joins siding, or places where vents and other objects protrude from walls. Carefully read manufacturer's directions to make sure the caulk you buy will work where you plan to use it, and don't forget to purchase a caulking gun. Early fall is a good time for this task because caulk becomes difficult to apply when the temperature falls. I hope these tips inspire you to begin prepping your home for the coming season! You’ll be glad you took the time to prepare so that you can thoroughly enjoy all that the fall season in Lexington has to offer. If you are interested in relocating to the area or have questions about the Lexington Real Estate market, please contact me today!